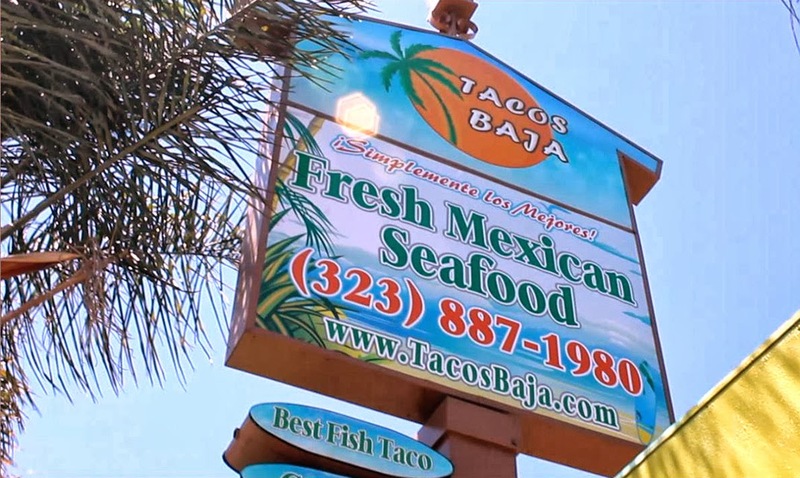 Forever on lists of best taco joints in Los Angeles, Tacos Baja makes one of the most delicious Fish Tacos in town. 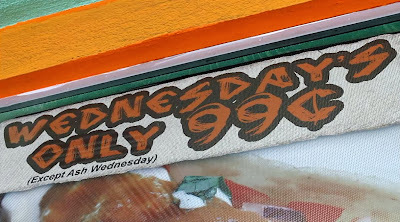 These battered deep fried filets of perfection are also one of the best deals around, especially on Wednesdays, when they are sold for only 99 cents! 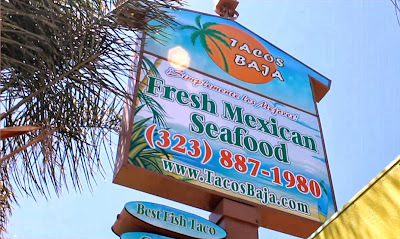 Only 5 minutes east of downtown LA, this Whittier Boulevard seafood taqueria has half a dozen small seats inside, but has plenty of outdoor patio seating. I showed up about 2 pm after the lunch rush and had 6 people ahead of me. The line moved fast and I placed my order in just a few minutes. 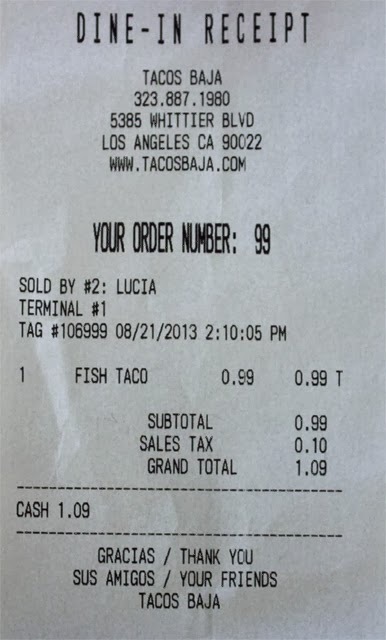 As expected, this is the busiest day of the week, but the cooks of Tacos Baja are efficient (they fry up a basket full of fish filets to stay ahead) and my taco was ready in no time. The deep fried batter is well-seasoned and cooked to perfection. The fillet has a thick seasoned crust and the bass fish filet is flaky and moist. 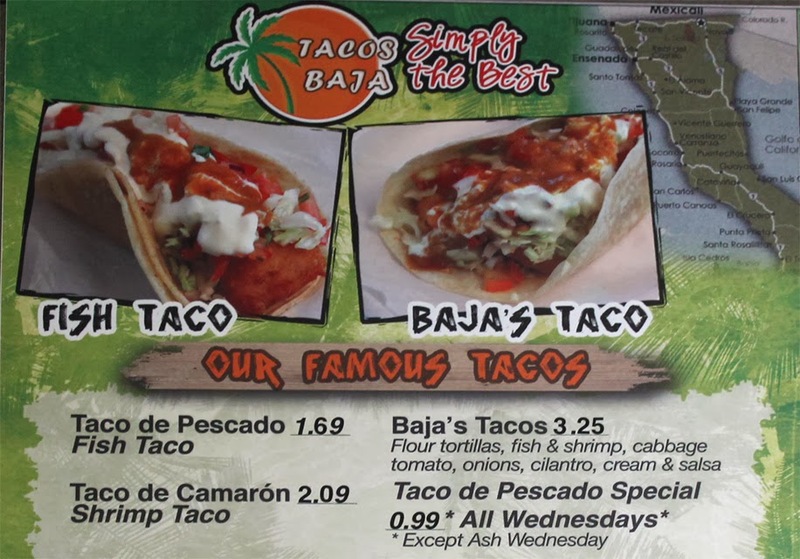 The Fish Taco is loaded down with a Mexican-style chopped tomato/cabbage slaw that is topped with cream and chile sauce. When you try to pick up the taco half of the slaw is left on the plate, so be sure to get a fork to finish it off with. The chopped veggie topping has just the right amount of chile heat -- not too much. 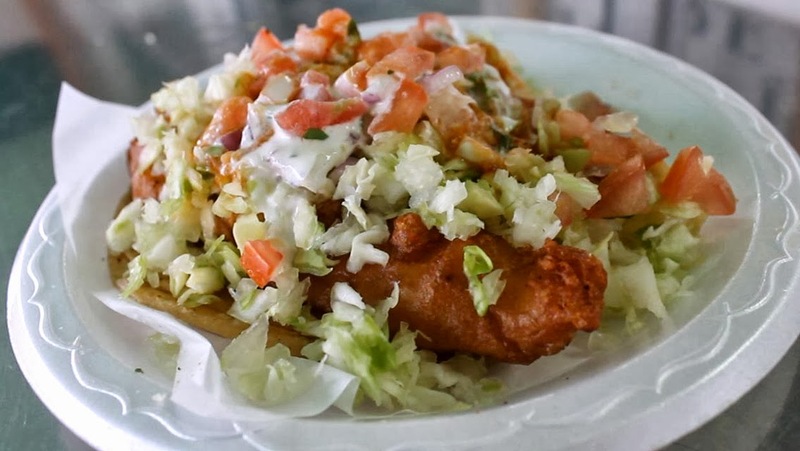 The combination of chopped red onion, tomato, cabbage and cilantro is a good contrast to deep fried battered fish. 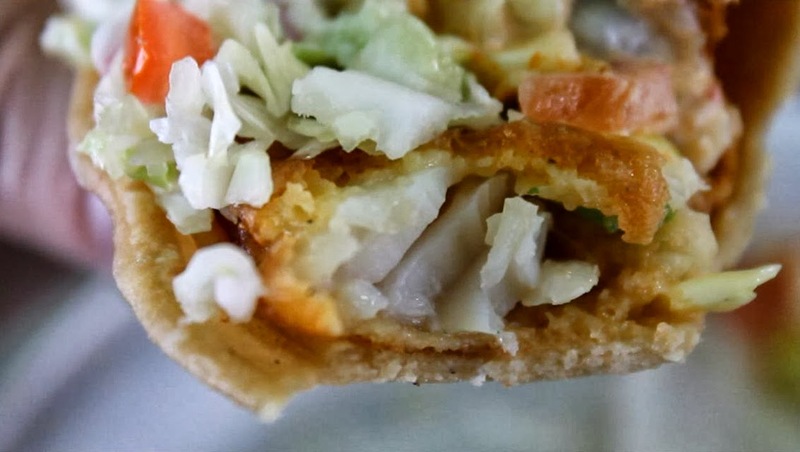 This is a substantial Fish Taco for 99 cents. An order of two is plenty for most appetites, but if you are unsure, then order an extra one so you don't have to wait in line again. And you will definitely want more than one -- they are that tasty. 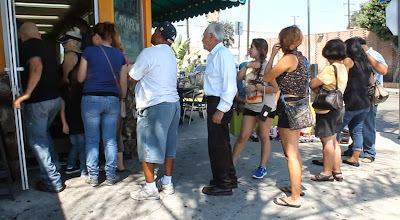 I haven't tried other seafood menu items, but I noticed a few of my neighbors enjoying large bowls of tomato and chile Caldos (broths or soups) loaded with pescado (fish,) camarone (shrimp,) and a mixo (seafood combination.) While the most expensive item on the menu ($8.99 - $12.99,) it's still a decent deal. There are also a large selection of chilled seafood cocteles or cocktails. 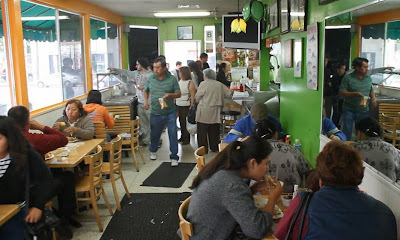 And of course they carry typical grilled meat-filled tacos, tortas, burritos, plus rice and bean combo plates. 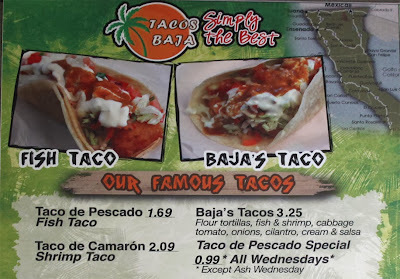 Make sure to visit Tacos Baja for their Wednesday 99 cent Fish Taco, or any day really, since they normally cost just $1.69. And watch my Cheap$kate Dining 99 Cent Fish Taco video for my 1 to 9 rating, 9 being best. 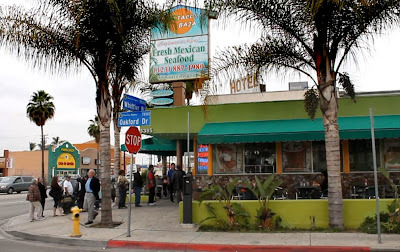 I know it's a foregone conclusion, but you will enjoy the bustling scene and tasty food footage. Finally make sure to check back for The 99 Cent Chef's Fish Taco recipe. 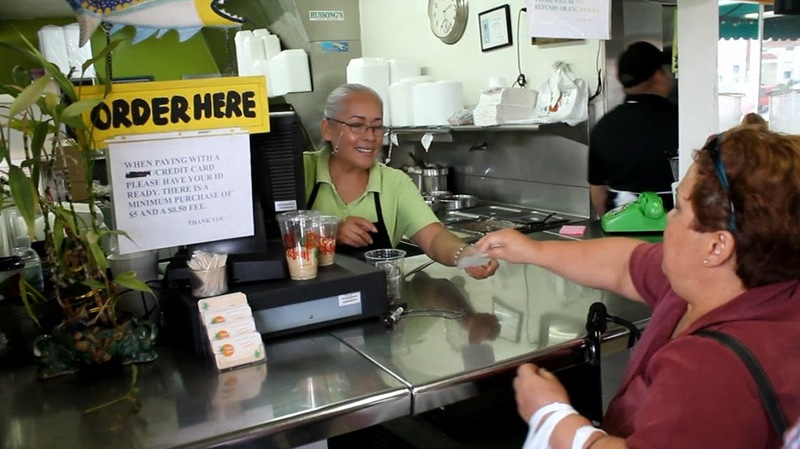 To view Cheap$kate Dining Video on YouTube, click here. It looks delicious and you can't beat the price! 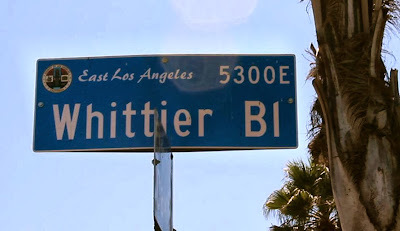 I thought you'd say a 9. I love fish tacos and my shortcut method uses a good quality fish stick--which I bake, then add similar components--chopped cabbage which I season w/ lime juice, salt, pepper, and let sit to wilt a bit. 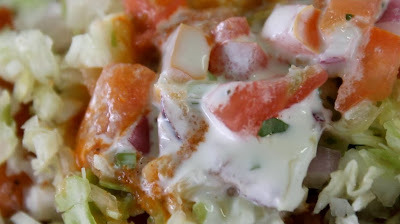 Toppings include diced tomato, and a yogurt/sour cream combo or Ranch dressing is o.k. 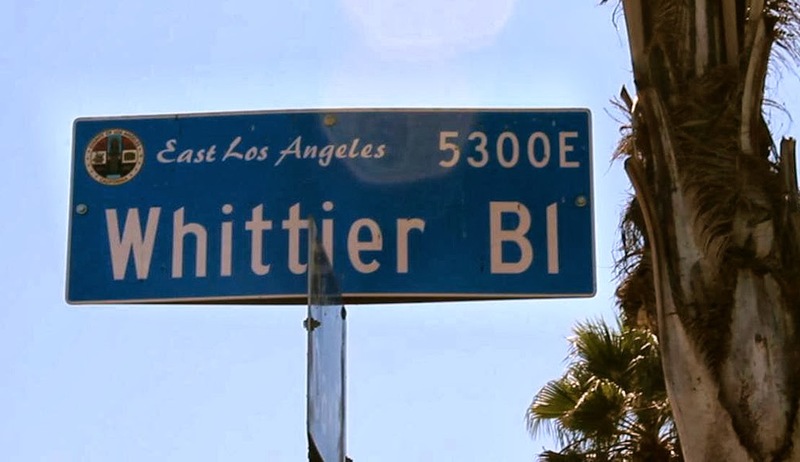 in a pinch. I love cilantro on my fish tacos--husband can't tolerate cilantro, sounds crazy but it makes him feel like he will pass out. 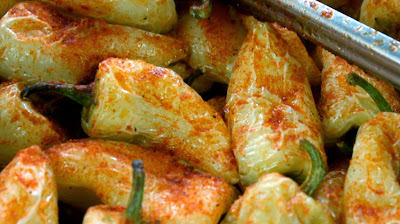 No cheese though--I prefer the clean taste of the fish, cabbage and lime and the lighter yogurt/sour cream combo. This is one dish where less fat is preferable taste wise.